Mumbai: Shares fell 2.5% to their lowest level in more than two years after heavy selling by funds in banking, metals and software stocks, analysts and traders said. 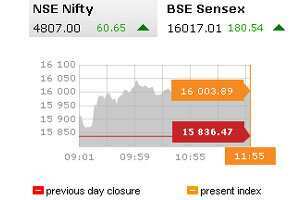 At 3:16 pm, the main 30-share BSE index was down 2.1% at 15,513.43, but had fallen to 15,425.20 earlier, its lowest level since November, 2009. The broader 50-share NSE index was down 2.1% to 4,647.35. The Indian rupee jumped more than 2% on Friday and was on track to post its biggest single-day rise in more than two years. The Reserve Bank of India, late on Thursday, reduced trading limits for banks in the foreign exchange market, making it difficult for market players to keep speculative positions open for a long time. The move could help attract foreign institutional investors back to a market where they invested more than $29 billion in 2010, but have been net sellers for $300 million so far in 2011.